Killer Beer Apps from Fosters! Straight from the Foster’s Art of Chilling stable, here are a few apps that will allow you to gift a pint to your mate, Gift a Chill Head, Introduce Strong, Art of Chilling, Share the Freshness and ‘Time2Chill’! Continue reading to learn a little more about each app. Foster’s take on the traditional gifting app allows you to gift your mates chilled out gear like a cool pint to help relax after a long day at work or you could gift the F Badge to a friend whom you know is a certified chiller! Whatcha waiting for get gifting! Did you know you could win an iPad2, Android phones and tons of other goodies simply by Introducing Strong? Check out this cool app and give it a shot, who knows, 1 click could win you some cool stuff. To take part, click here. 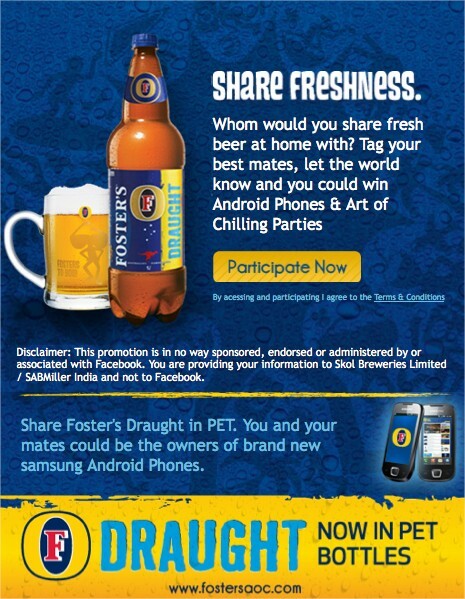 This app allows you to share the Freshness of Foster’s Draught in 1 ltr PET bottles with 3 of your best mates, which in turn makes you eligible to win Android phones, Art of Chilling parties, tons of other goodies and of course most important of all, the title of Most Chilled Out Gang. To take part and start sharing, click here. We have 6 situations that require YOUR Chilled Out solution! Give us your most creative answers and garner as many vote as you can on them. If your answer ends up getting voted most Chilled Out, you’ll be walking away with a customized Art of Chilling iPad2! Can it get any better? We think not so click here to check out the situations and make sure to put your creative thinking hats on. This cool app/micro site helps you unwind, kick back and chill for 2 minutes as you listen to the calm tune of waves crashing onto shore. Sounds easy? 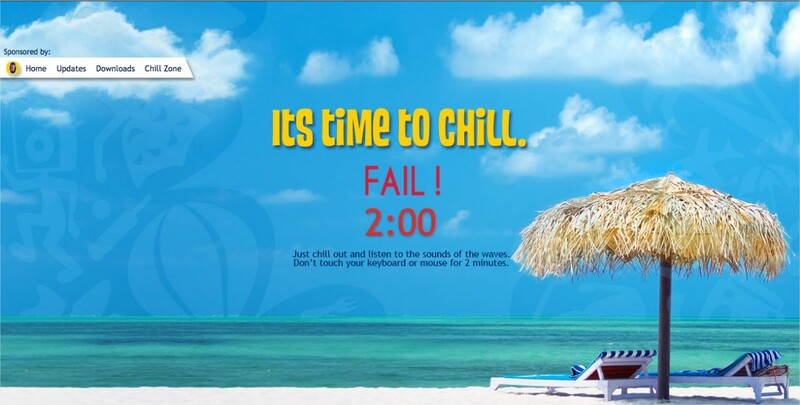 It is but make sure not to touch your mouse or keyboard or the ticker restarts at 2 minutes! Click here now because its YOUR Time2Chill.